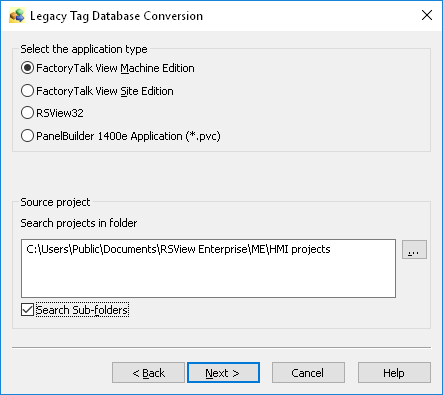 I tried to use the Legacy Tag Database Conversion tool, selected “Create Factory Talk View Tag Database in new format”, then I selected “Factory Talk view Machine Edition”, selected the source folder and used the option to “Search Sub-folders”. After hitting the Next button it shows a list of available projects, but the one project that I try to convert is not listed. Any ideas how to approach this? Is it possible to install multiple revision supports with Factory Talk View? So, far I always used the latest and just created the run time as an older version, if the panel I used wasn’t updated. Please let me know what you guys think I should try. When you say you are trying to open a FTView Studio project last opened with Ver 5, how did this Ver 5 project wind up on your development PC? If you copied the project, the APA application file, FTView Studio does not see it in its HMI Projects folder. FTView Studio requests to store ALL FTView "restored" projects to a specific location (C:\Users\Public....\HMI Projects). Is the restored, Ver. 5 application physically located in the target directory (C:\Users\Public....\HMI Projects)? Have you tried, instead of selecting "Search Sub-Folders", to select the Browse button to the right and drilling to the location of the restored, Ver 5 application?